Dark money groups continue to put up large sums backing Rep. Ed Markey (D., Mass.) in his U.S. Senate bid, despite Markey’s stated distaste for such groups. Two liberal dark money advocacy groups have dropped hundreds of thousands of dollars in the past week either supporting Markey’s candidacy, or attacking Gabriel Gomez, his Republican opponent. The League of Conservation Voters (LCV) stepped up its involvement in the race on Wednesday, announcing it would spend nearly $400,000 on campaign mailings attacking Gomez for supporting the popular Keystone XL Pipeline. "Gomez stands with big oil, and would expand risky tar sands production even though it would leave taxpayers on the hook for cleanup costs instead of the polluters," said LCV spokesman Jeff Gohringer in a news release. That statement came after it was revealed that LCV’s chairman oversees investment decisions at a hedge fund that owns more than $700 million of stock in oil company BP. Another dark money environmentalist group, the NextGen Committee, has spent more than $270,000 in the past week attacking Gomez or supporting Markey. Billionaire Tom Steyer, who is vehemently opposed to the Keystone Pipeline, runs NextGen. These recent expenditures continue a trend that began during the Democratic primary for the Senate seat, which pit Markey against Rep. Stephen Lynch (D., Mass.). Lynch received far less support from dark money groups. According to data gathered by the Sunlight Foundation, third-party political groups have spent more than $2 million supporting Markey or attacking Gomez or Lynch. Much of the money has come by way of dark money groups that were empowered by the 2010 Citizens United Supreme Court ruling, which Markey has compared to the court’s infamous Dred Scott decision. Gomez has enjoyed only $69,000 in independent expenditures supporting his campaign, spent by the Committee for a Better Massachusetts. Despite benefitting from significantly higher amounts of independent expenditures, Markey has complained that his campaign could be "drowned in a wave of … special interest money." 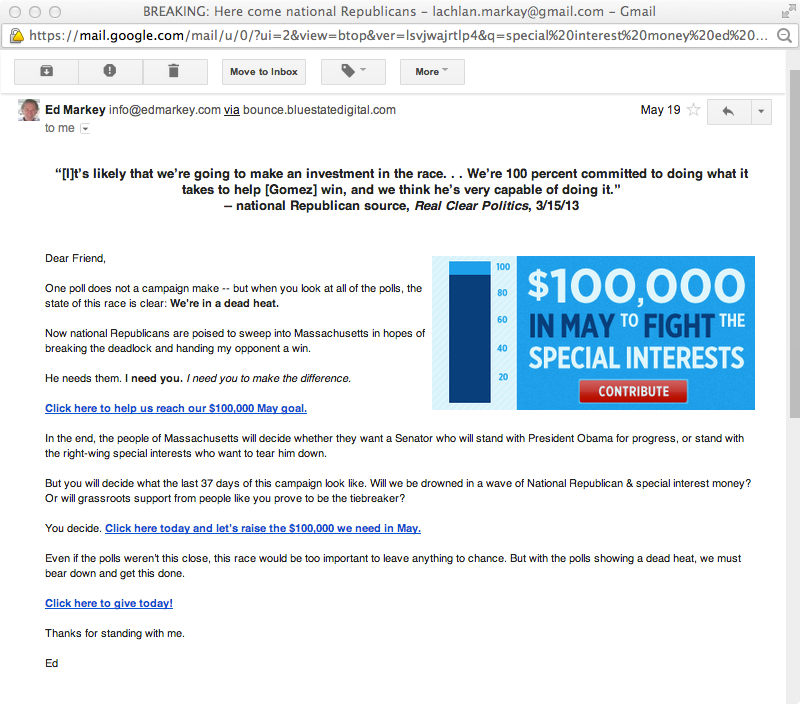 Markey has also tried to make an issue of Gomez’s refusal to sign the so-called "People’s Pledge," which aims to discourage third party groups from funding political advertisements. 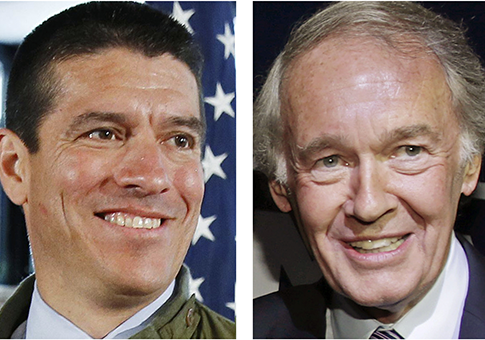 "The people of Massachusetts have a right to know who is backing each of the two candidates, so they can make an informed judgment about the source of funding," Markey said of his support for the pledge. Markey has received significantly more money from groups that are not required to disclose their donors by exploiting what some say is a loophole in the pledge. Because it only pertains to independently funded advertisements, dark money groups can still spend unlimited sums supporting candidates through activities such as polling, canvassing, or phone banking. Asked for comment, campaign spokesman Andrew Zucker said Gomez "opened the door for outside groups to spend money in this election when he repeatedly refused to sign the People's Pledge." "His feigned outrage over outside spending is ridiculous given the fact that the Republicans were the first to jump into the race and have already spent $800,000 airing ads on Gomez's behalf," Zucker added in an emailed statement. The Democratic Party's Senate campaign arm reportedly purchased $750,000 in advertising time in Massachusetts on Thursday. This entry was posted in Politics and tagged Congress, Democratic Donors, Ed Markey, Gabriel Gomez, Progressive Movement, Stephen Lynch. Bookmark the permalink.